Borga Panel is a utility panel designed with economy and flexibility in mind. This exposed fastener panel can be used in roof and wall applications as well as for interior partition and liner panel needs. It is commonly used in mini-storage construction due to its’ versatile design with shear strength and structural spanning capabilities. Other applications are agricultural, light commercial, industrial and residential. 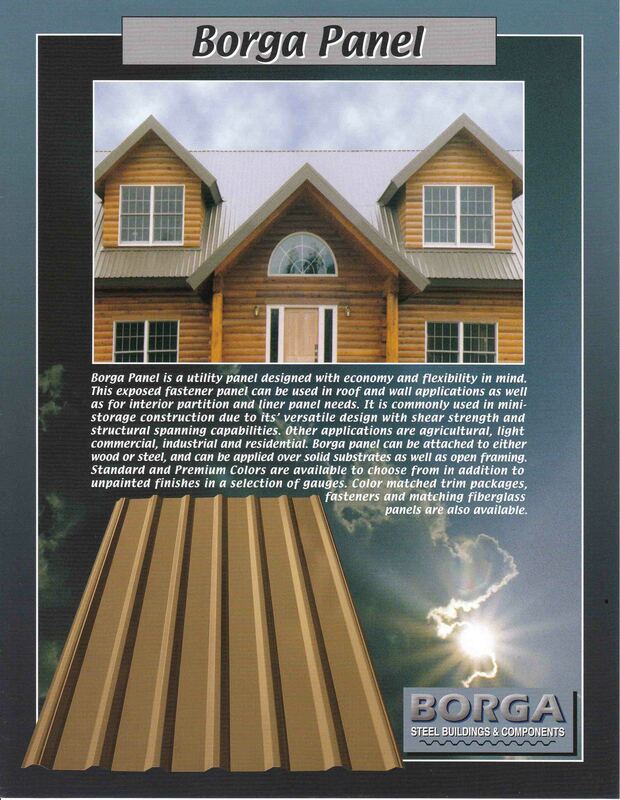 Borga Panel can be attached to either wood or steel, and can be applied over solid substrates as well as open framing. Standard and Premium Colors are available to choose from in addition to unpainted finishes in a selection of gauges. Color matched trim packages, fasteners and matching fiberglass panel are also available. Metal is a noncombustible material and therefore holds the highest fire rating available – Class A. Therefore, many insurance companies offer discounts on fire insurance from homes with metal roofs. Please not that the classification of the material is not necessarily the fire classification of the entire roof; the roof will be fire rated based on all materials present.